News media often seek to enhance their stories by identifying and interviewing expert sources. Those business leaders, entrepreneurs and scholars were contacted because of their knowledge, reputation, experience and familiarity with journalists, but that free cameo on TV or quote in the newspaper can be invaluable in solidifying your brand locally or even nationally. Do you know your stuff, too? Then you may be wondering how you or your company can become that go-to media expert. It’s not always easy to inject yourself into the conversation, but if you have the knowledge, experience and willingness to share accurate, reliable information relevant to your industry, then you’re well-equipped to be an expert. Outline your expertise: Generate a list of topics that are your specialty, and create a clean, one-page bio sheet that can easily be shared when pursuing media opportunities or speaking engagements. Develop a pitch: Examine industry trends and developing news stories, and consider how your knowledge is relevant to the discussion. Research what media sources might consider your expertise as an asset. Write an article: Community, business and industry publications often publish guest opinions and contributed articles that offer helpful advice to readers. It must be timely, comply with submission guidelines and not attempt to sell a product or service. This also helps frame your thoughts and talking points for interviews down the road. Build relationships with the media: Ever wonder why some TV stations, newspapers or magazines use the same source on multiple occasions? It’s because a reporter or assignment editor has become familiar with that individual, trusts the information they provide and is granted easy access to that person. Remember that it takes time to develop credibility. Pursue speaking engagements: All year, local groups like chambers of commerce, industry associations and community organizations invite guest speakers to their meetings and luncheons. Consider which audiences are relevant to your industry and offer your expertise at an upcoming event. Positioning yourself as a trusted authority can result in tremendous earned media opportunities. A trusted public relations partner can help leverage your expertise, build confidence in your brand and prepare for your next media interview or speaking engagement. 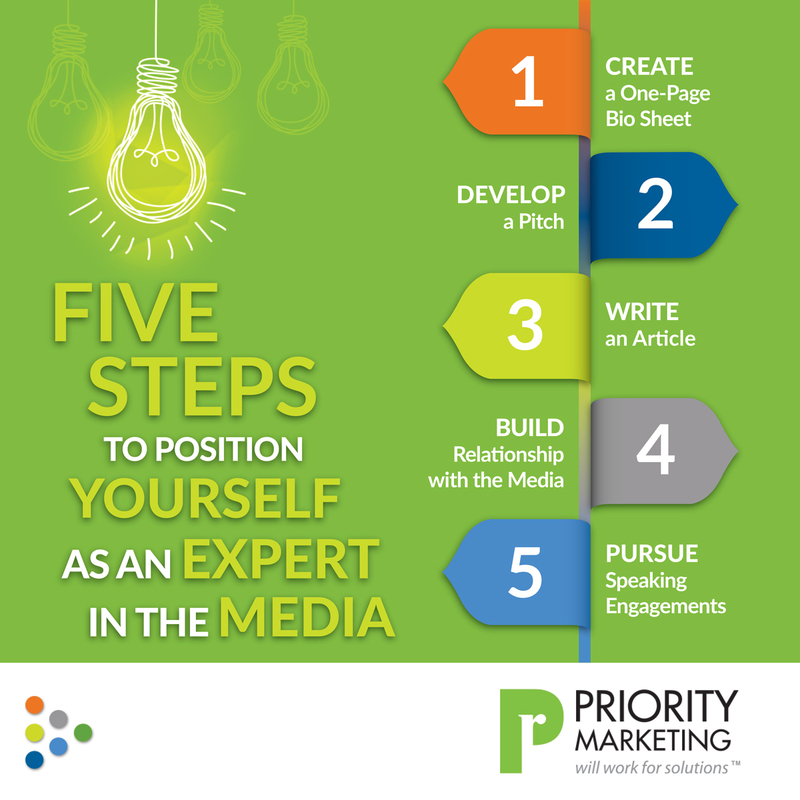 To find out how you can become an expert source in the media, please call Priority Marketing at 239-267-2638.